Hibiscus Rose Mallow (Hibiscus spp.) on Wool, scoured but no pre-mordant or pre-Alum. Far left, Hibiscus with a pinch of copper after-bath. Middle, dried Hibiscus flowers mashed (in the dye pot while simmering, before adding the wool) to yield a darker color. On the right wool and soy-silk simmered conventionally with dried Hibiscus. Other fibers – like silk – will probably get different results – but this is what I got dying wool. Again, the wool samples were not pre-mordanted. Simmered, lowest stove setting, for about 3 hours, sat in the pot 2 days. I haven’t done a fade-test yet but much of my dyed wool ends up a boot sock, in a boot out of the sun, under a hot pot, on the floor, on a wall but not out in the sun so up to now fading hasn’t been a problem. done starting with mostly yellow, excluding the black wood. Next, I’m trying to find local plants that don’t require strong chemical mordants. Like onion peel and Wood Sorrel, you can probably use this at home. Copper after-bath on the far left could have been accomplished with an Indigo over-dye, otherwise the rest of the tests were done without mordanting (copper, tin, chrome, etc.) Different dye-times and mashing up the dye stuff yield different shades of yellow. I don’t mind using vinegar or amonia, but those two didn’t change the color much. Lastly, Hibiscus is easily available in Los Angeles, southern California, and works dried or fresh. The shrubs are all around the city and I have a small plant at home so it’s easy to stock up. For a good laugh, picture me wandering around in the back of a Nordstrom’s parking lot with picking up dried Hibiscus. 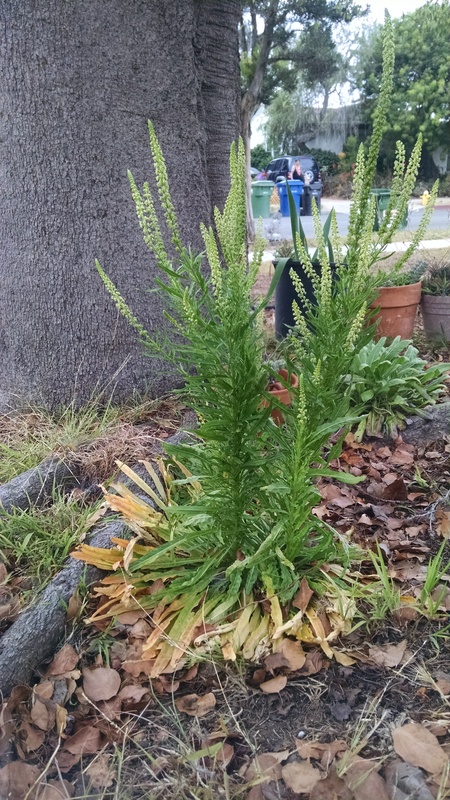 Since I now know what I’m actually growing I’ve been reading up on Dyer’s Weld (Reseda luteola) – Ida Grae, etc. It can be used fresh or dried and I’ll probably harvest the tops as they bloom and dry them. I put a yard stick in the picture for size context. 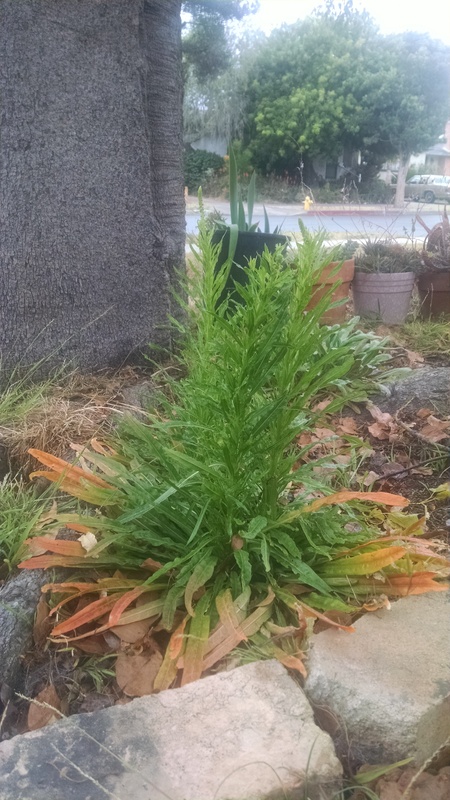 Picture below is a 2nd year plant. I’d say it falls between my elbow and shoulder but since I’m behind the camera that doesn’t give anyone an idea of the height. Fennel has also become one of of my seasonal markers. Wood Sorrel runs through half of the year and as it dies off the Fennel starts up. And visa versa. So I am always stocked with yellow dye. Quick note: Fennel by my experience works only well with protein fiber (i.e. wool), I’ve never successfully dyed plant fiber such as cotton. Wood Sorrel on the other hand dyes anything I’ve tried. The only exception has been corn fiber.